Peter J. Grundhoefer joined the firm in 1994. His expertise was centered on Estate Planning, Probate, and Municipal Law. Pete served as legal counsel for the cities of Stacy, Harris, Rush City, Center City, and a number of townships. He was a valued member of the Chisago Lakes community and volunteered for the Lions Club, Rotary, Family Pathways, and the Chisago County Historical Society. Pete served on a number of boards in the community. He and his wife Mary, and son Jack have been integral members in the Chisago Lakes area. Pete passed away in December of 2014. His legacy in the firm and the community will be longstanding. Some of you may have noticed the firm name looks a bit shorter and wondered to yourselves, “Where’s Bruce?” Well, after more than thirty-five years, Bruce retired from private practice at the end of December 2011. Bruce has diligently served many clients in Chisago Lakes and the surrounding areas during his career. Although retired from the office, Bruce continues his long-held position as a part-time state public defender at the Chisago County Courthouse. In April 2012, Bruce was presented with the Michael Johnson award by the Tenth Judicial District Public Defender’s Office for his years of outstanding service. He also served as past President of both the Chisago Lakes Area Chamber of Commerce and the Chisago Lakes Lions Club. Bruce resides in Lindstrom with his wife, Sue, where they raised their family. The firm wishes to take this opportunity to recognize Bruce’s leadership, years of service, and his many contributions to the community. 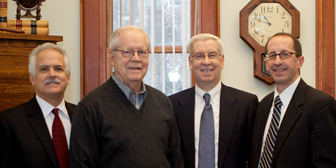 Since founding the firm in 1949, and after his retirement in 1987, Howard has continued to reside in the Chisago Lakes area. He is now 91 years old and continues to amaze the locals with his positive outlook, gentle disposition and gift on the links. We’ve lost count of the number of times Howard has “golfed his age,” but the total is well in excess of 250. Howard’s loving wife, Marlys, passed away in 2010 after they had shared many happy years together as a married couple and raising their family. Post retirement, he and Marlys spent winters in Arizona enjoying their well-earned retirement years. Howard was uniformly respected as an attorney because of the thoroughness with which he prepared his cases and because of a demeanor which garnered the admiration of clients, colleagues, court personnel and Judges. More importantly, he is well-liked by all those in his community who have come to know him. We are honored to be part of the legacy which Howard began, and we wish him all the best as he continues to move gracefully forward. Our legal representation and business are built on relationships and the goal of serving clients with respect and concern.